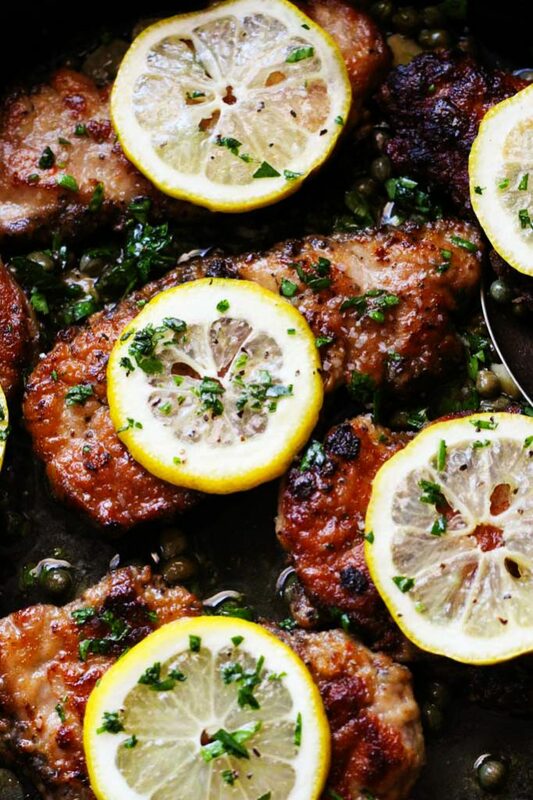 I’m a huge fan of Piccata – for two reasons really. First, it’s super easy and quick to make and, second, everyone loves it! Chicken Piccata and Pork Piccata are both on regular rotation at our house, but today I thought I’d try something different. 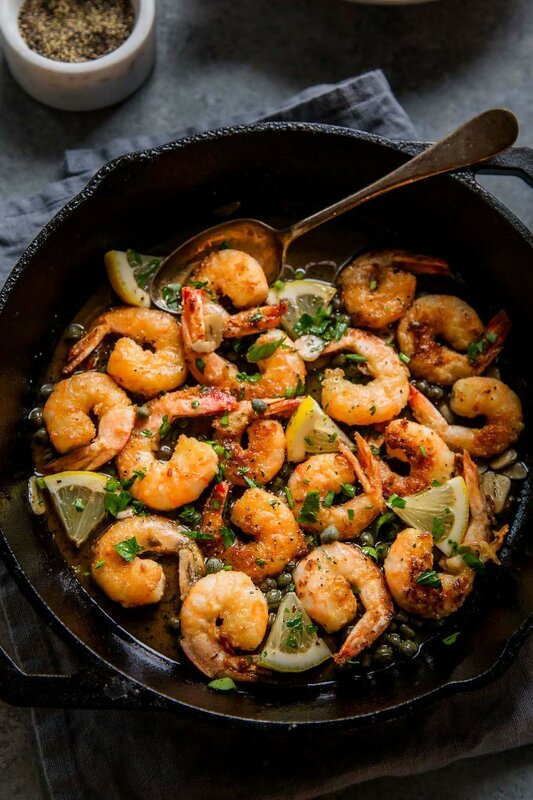 Shrimp Piccata! And, instead of serving this Piccata up as a main dish, I thought why not try it as an appetizer. 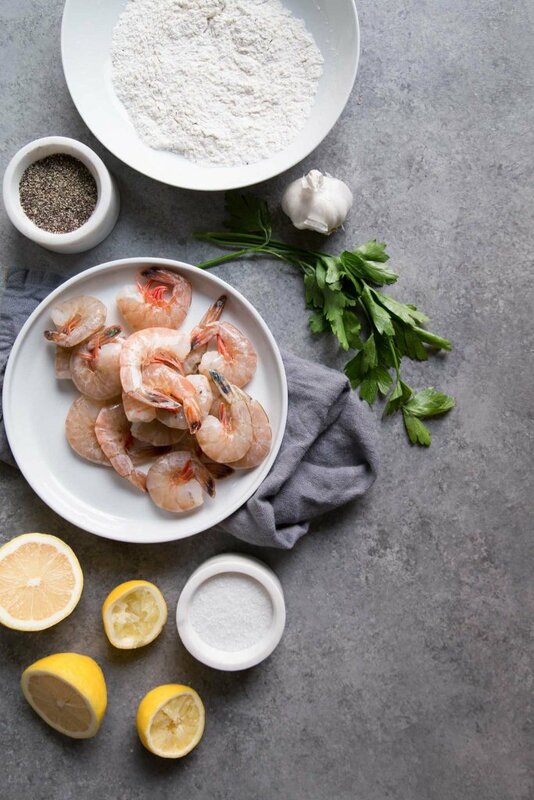 I mean, shrimp are the perfect size for small bites that are perfect for serving at a party, and since the Piccata sauce is already a guaranteed crowd-pleaser, it really just made sense! But then I got to thinking… What’s the difference between Shrimp Piccata and Shrimp Scampi? What really makes this dish unique? One word of caution when you’re making the sauce – Be sure not to overcook your garlic or it can become bitter. 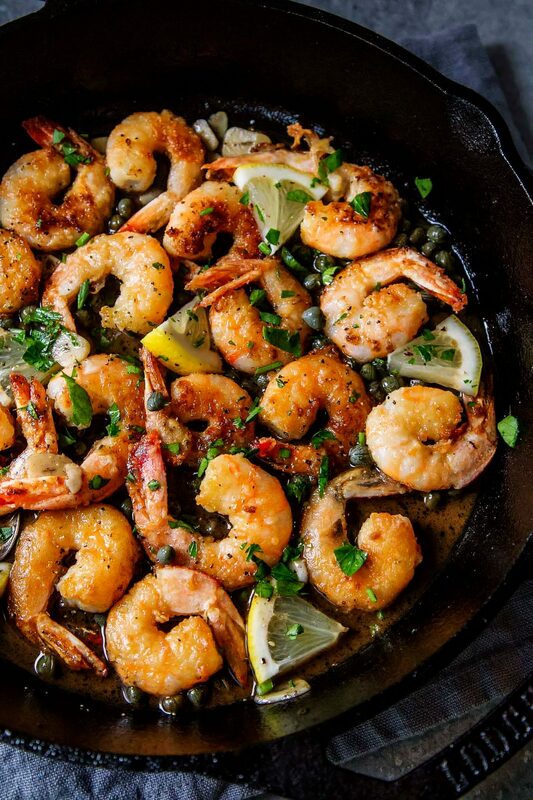 It helps to let your skillet cool down a bit after frying up the shrimp. You don’t want the skillet scorching hot. Instead, now you want your skillet heated to medium. Also, don’t let the slices cook for any longer than the 30 seconds called for… They turn golden in an instant. Once they’ve reached that color, immediately add in the white wine, chicken stock and lemon juice and watch it sizzle away and reduce until that magical consistency is reached. I served these Shrimp Piccata bites up to my guests straight out of the skillet. It was a low-key get together that called for just the two necessities – good food and great wine! To go alongside the Shrimp Piccata I chose a Sauvignon Blanc. 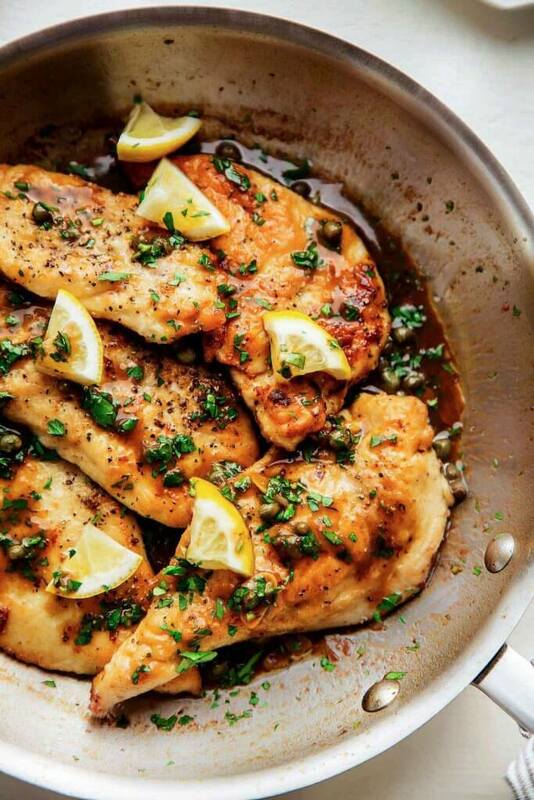 Its bright citrus and herbal notes paired perfectly with the lemon and parsley in the piccata sauce. 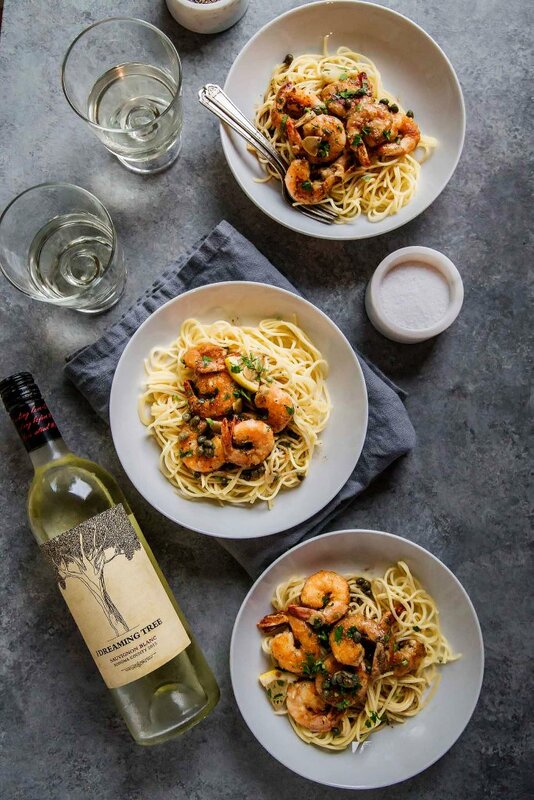 This Sauvignon Blanc from Dreaming Tree fit the food and the occasion perfectly… Unfortunately, here in Oregon we were recently hit with a terrible forest fire affecting our beautiful Eagle Creek Wilderness Area. Our skies have been filled with smoke and our cars and homes covered in ash. What was once a gorgeous area with amazing views, forests and hiking is currently under fire. The Dreaming Tree brand is not only passionate about winemaking, but also has committed itself to protecting and restoring forests across the country. They have donated over $1M to environmental programs that protect tree and forestry programs across the country. 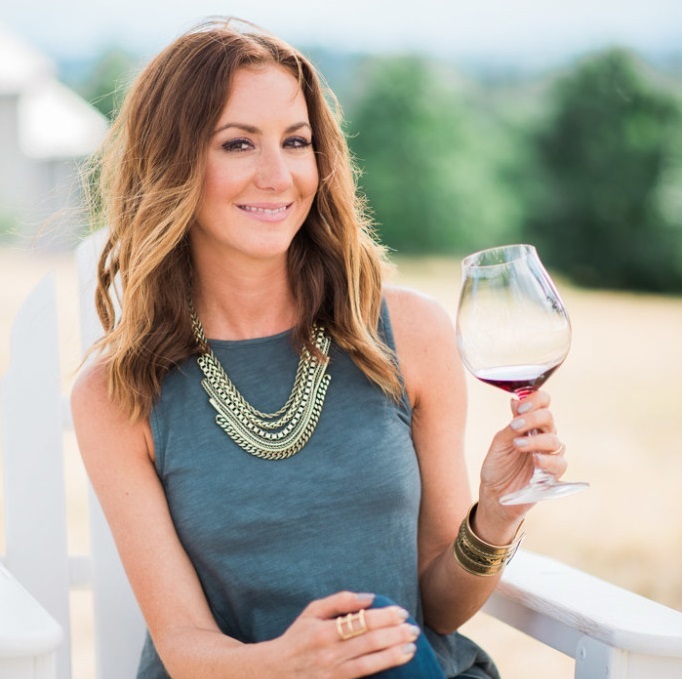 Their wines are delicious, affordable and approachable, and they also back a cause that I’m particularly concerned about right now. Be sure to look for Dreaming Tree wines at your local grocery, drug or supercenter stores. A little trick – just go to their website and locate their wines here. The Sauvignon Blanc and the Crush Blend are two of my particular favorites. Of course, you can also serve up this Shrimp Piccata on a bed of angel hair pasta to turn it into a traditional dinner. Either way, I’m guaranteeing that you will love it! Combine flour and a pinch of salt and pepper in a shallow dish. Toss shrimp in flour mixture until coated. Heat oil in a large nonstick skillet on medium. Add shrimp and cook 2 or 3 minutes, turn and cook 1 more minute. Remove shrimp to plate. Melt 1 Tbs. of the butter in the pan. Add the garlic and cook until golden brown, about 30 seconds. Add the wine, lemon juice and broth, increase the heat to medium-high and cook until the liquid is slightly reduced, about 5 minutes. Remove the pan from the heat and whisk in the remaining 1 Tbsp. butter, the capers and parsley. Stir in shrimp and season with salt and pepper, to taste. 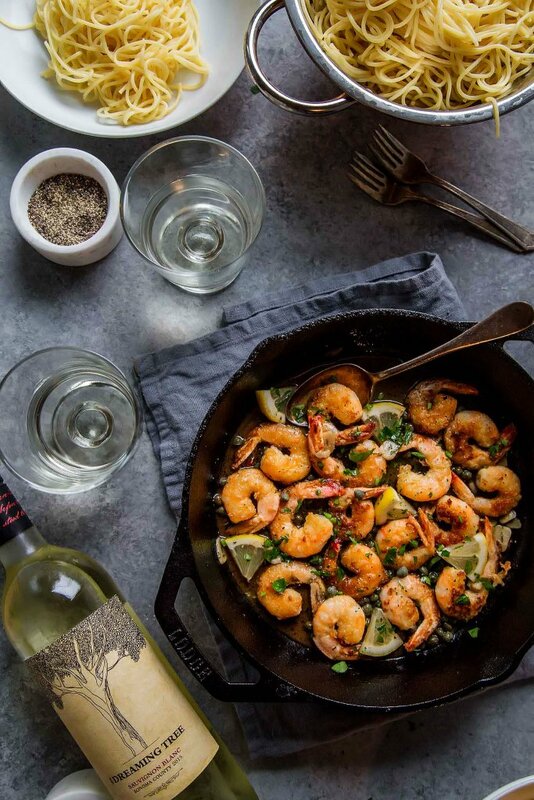 If you loved this Shrimp Piccata I would appreciate it so much if you would give this recipe a star review! Also, be sure to snap a picture of your finished dish and share it with me on Instagram using the hashtag #platingsandpairings and tagging me @platingsandpairings. Sauvignon Blanc has bright citrus and herbal notes that pair perfectly with the lemon and parsley in the piccata sauce. An easy to prepare and delicious recipe. Also good leftover. This was so good! Super easy and fast dinner I could get on the table even after an 11 hour work day! Love the Dreaming Tree wines! Thanks for the recipe. I’m so glad you liked it Theresa – You absolutely deserve some wine and yummy food after 11 hours at work!! !